Roller and ball bearings are available both on grinding wheel and regulating wheel. 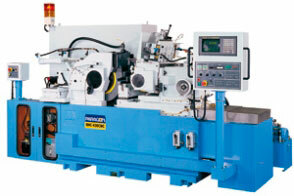 CNC Series is equipped with roller and ball bearings and Fanuc controller. Grinding wheelhead cover can be lifted by hydraulic cylinders that can easily and quickly change grinding wheel. Eliminate Backlash Device: has weights combined with roller bearing on the side of track to reduce the backlash between slideways and guideways to increase micro feed accuracy. The regulating wheel lower slide has weights combined with roller bearing on the side of track to reduce the backlash between slideways and guideways to increase micro feed accuracy.